Give a fun candy bar card to your friends this Halloween with these printable Halloween candy bar wrappers. With just a print and a wrap, you'll be giving lots of sweet Halloween treats this year with no trouble at all. Whether you like the creepy side of Halloween or lean more towards the cute side of Halloween, candy is pretty much a given this time of year. If you are throwing a Halloween party or you are just looking for a little something special to give as a gift for your kids, co workers, or friends, wrapping a chocolate bar in a cute candy bar wrapper is the perfect answer for anyone. I LOVE to give candy bar cards to everyone on my list. It's such a great way to give both a Halloween card and a gift to loved ones. Plus, they are so easy to print, wrap, and give but it looks like you went out of your way with lots of work. 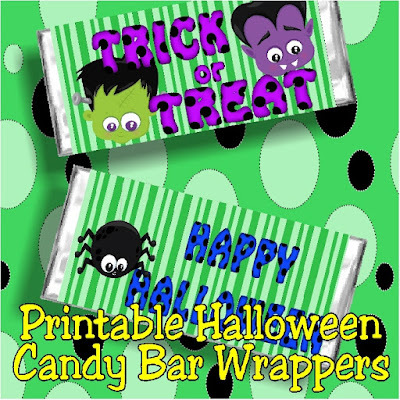 So just in time for your Halloween gift giving or Halloween party favors, I have gathered lots of printable Halloween candy bar wrappers for you. Some of these wrappers are free, and others are from small businesses around the country. I hope you'll support them and their families while making your own family feel a little bit sweeter with a printed Halloween candy bar wrapper and card! I love personalized gifts like this. Such a great idea and good for budgets too!